Time to celebrate our hometown heroes!!! Theresa Ann will be attending again this year. Come and join us again at the 2nd Annual BC Hero and First Responder Appreciation Day will take place on Saturday, September 16th at the Bicentennial Park gazebo, 11am-2pm. 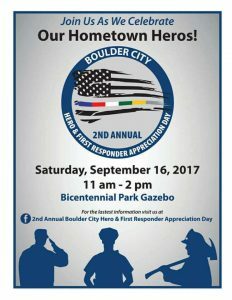 Boulder City Police will be there, along with Boulder City Fire, Lake Mead Rangers, Nevada Highway Patrol, Boulder City Mounted Unit, Mounted Posse, Hoover Dam police, military personnel, and many, many other heroes! This is a FREE event to honor all of our beloved first responders, who work so hard every day to keep us safe. This is going to be a fun, family event with lots of activities and food. Can’t wait to see another outpouring of support for our much deserved heroes and first responders!